Lepiceridae is one of the smallest of beetle families, with only four species. Two common names have been used for the family – the toadlet beetles and the false minute mud-loving beetles. For such a small group Lepiceridae has seen a number of taxonomic problems. The family has also been called Cyathoceridae, based on the type genus Cyathocerus Sharp 1882. Sharp was unaware of the earlier description of Lepicerus Motschulsky 1855. Unfortunately Motschulsky erroneously put Lepicerus in Georissidae. In 1878 Eichhoff described the genus Lepicerus in Scolytidae. 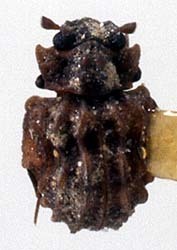 Hinton (1936) changed that scolytid genus to Lepicerinus, which has since been recently synonymized under the scolytid genus Scolytogenes Eichhoff 1878. Lastly, Kirejtshuk and Poinar (2006) described a fossil lepicerid, Haplochelus georissoides, but put it in the new family Haplochelidae. Lawrence has since considered it as a true lepicerid (pers. com.). Lepicerus Motschulsky has since its description been erroneously listed in Georissidae or likened to georissids. This can only be due to the briefest of examination of its form and/or the similarity of the habitat of Lepicerus inaequalis and georissids. Morphologically no one could confuse these two groups. And newer habitat information finds only the smallest of similarities. Available habitat information for Lepicerus shows a gradient of sites from wet stream banks (L. inaequalis) to dry cypress woodlands (L. bufo) to dry plantain fields (L. pichilingue) (Shepard et al. 2005; Navarrete-Heredia et al. 2005; Flowers et al. 2010). This differs from most myxophagans which have more aquatic habitats. Collections of Lepicerus spp. have been from 128-1427 m in elevation. All extant lepicerids are Neotropical, occurring from Mexico southward to Venezuela and Ecuador. Haplochelus georissoides is from Burmese amber. 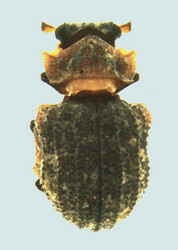 Lepiceridae is notable in that it is one of the very few beetle families for which no larva has been formally described. One presumed lepicerid larva exists (J. Lawrence, pers. com.). The only published phylogeny that includes lepicerids (Beutel 1999) has Lepicerus as a sister group to (Hydroscaphidae + Torridincolidae). Arce-Pérez, R., J. L. Navarrete-Hereida and R. G. Beutel. 2005. 6.1. Lepiceridae Hinton, 1936 (= Cyathoceridae). Page 45. In: Beutal, R. G. and R. A. B. Leschen (eds.). Coleoptera, Beetles. Volume 1: Morphology and Systematics (Archostemata, Adephaga, Myxophaga, Polyphaga partim). Handbook for Zoology. Walter de Gruyter. Berlin, New York. Beutel, R. G. 1999. Phylogenetic analysis of Myxophaga (Coleoptera) with a redescription of Lepicerus horni (Lepiceridae). Zoologischer Anzeiger 237 (1998/99): 291-308. Eichoff, W. J. 1878. Ratio, descripto, emendatio corum Tomicinorum qui sunt in Dr. Medin. Chapuisi et authoris ipsius collectionibus et quos praeterea recognovit. Mem. Soc. Roy. Sci Liege, ser. 2, 8: 1-531. Flowers, R. W., W. D. Shepard and R. T. Mera. 2010. A new species of Lepicerus (Coleoptera: Lepiceridae) from Ecuador. 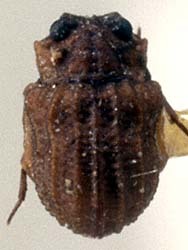 Zootaxa 2639: 35-39. Hinton, H. E. 1934. Two coleopterous families new to Mexico. Pan-Pacific Entomologist 9: 160-162. Hinton, H. E. 1936. XLVI.--Lepiceridae-a new name for the Cyathoceridae. Lepicerinus—a new name for the scolytid genus Lepicerus Eich. (Coleoptera). Annals and Magazine of Natural History, 10th Series 17(No. 100): 472-474. Kirejtshuk, A. G. and G. Poinar. 2006. Haplochelidae, a new family of Cretaceous beetles (Coleoptera: Myxophaga) from Burmese amber. Proceedings of the Entomological Society of Washington 108(1): 155-164. Motschulsky, V. 1855. Voyages. Lettré de M. de Motschulsky á M. Ménétriés. No. 2. Etudes entomologiques 4: 1-84. Navarrete-Heredia, J. L., J. Cortés-Aguilar and R. G. Beutal. 2005. New findings on the enigmatic beetle family Lepiceridae (Coleoptera: Myxophaga). Entomologische Abhandlungen 62(2): 193-201. Reichardt, H. 1976. Revision of the Lepiceridae (Coleoptera, Myxophaga). Papeis Avulsos de Zoologia 30: 35-42. Sharp, D. 1882. Cyathoceridae. Coleoptera. Biologia Centrali-Americana 2: 141-144. Shepard, W. D., R. E. Roughley and W. Porras. 2005. The natural history of Lepicerus inaequalis Motschulsky (Coleoptera: Myxophaga: Lepiceridae) in Costa Rica, and additional morphological descriptions. Folia Entomologica Mexicana 44 (Supplement 1): 97-105. Page: Tree of Life Lepiceridae. Toadlet Beetles. Authored by William Shepard. The TEXT of this page is licensed under the Creative Commons Attribution-NonCommercial License - Version 3.0. Note that images and other media featured on this page are each governed by their own license, and they may or may not be available for reuse. Click on an image or a media link to access the media data window, which provides the relevant licensing information. For the general terms and conditions of ToL material reuse and redistribution, please see the Tree of Life Copyright Policies.